Can You Trust a Wine Recommendation? We say, not anymore. In fact, for most, trusting wine recommendations has only resulted in frustration and lost dollars, since the beginning of time. The lucky ones are those who get recommendations from people who know their personal taste very well or strive to find out what they might like, before pushing their own taste or agenda down their throat. The sad part is that until today, in an era of advanced technology and transparency, most traditional wine retailers are still stuck to the old ways of doing things. Make sure my staff know their stuff and can sell the wines I tell them to. This, today, has become the ultimate recipe to failure. Not to take steam from professional sommelier, independent writer and wine industry consultant, and in my opinion visionary, Douglas Levin. If Douglas’ experience at that doomed wine tasting event does not wake up the retailer in you to shift gears, I am not sure what will. The article hits the nail on the head. After reading the article below, watch this video. Then run, don’t walk, and sign up for QUINI SOMM. This is not a plug, but a strong, genuine recommendation. To help you change your thinking quickly. To make a consumer-centered investment for your operation and teams to thrive, going forward. The status quo no longer works and many of you already see it in your P&L. Here is Douglas’ entire article. You can also catch it on his blog. So, maybe you can trust friends, or family to make a reasonable recommendation, but can you trust your wine retailer? I attended a wine tasting hosted by Total Wine this evening and was so dumbfounded by the event, it seemed important to write about. See the brochure for the event below. Perhaps you have attended something similar at the Total Wine near you? A new store manager introduced herself and it seemed the intent of the event was to meet some of her higher volume customers. I purchase enough wine and spirits from the Total Wine near me to have earned a membership in the top tier of their Total Discovery club. This was a free event for a select group. I have never tasted such a poor selection geared toward wine enthusiasts in one place. What kind of impression was the new manager trying to make? Either, she was never trained to select quality wines, or this event was used as an opportunity to push a bunch of awful wine with higher profit margins. Either way, a sad proposition. The previous manager at least included a few better wines in every event and made it worth attending. This was outright torture. I happen to overhear a customer asking how she could dislike so many of the wines and the attendant responded something like this: “These wines might not appeal to everyone. You should stretch your thinking to include other wine styles.” Oh my gosh, she was pulling the shame card. As if the poor, unsophisticated know-nothing wine drinker could just open their mind… and appreciate other “important” wine styles. The assumption is suggested that we are totally incapable of judging impartially what a “good” wine is. While this approach was nearly insulting, the idea is one I have used before in discussions with wine enthusiasts. That is… if the wines are actually selected to represent good examples of their region of origin. In this case, it was used as an excuse. 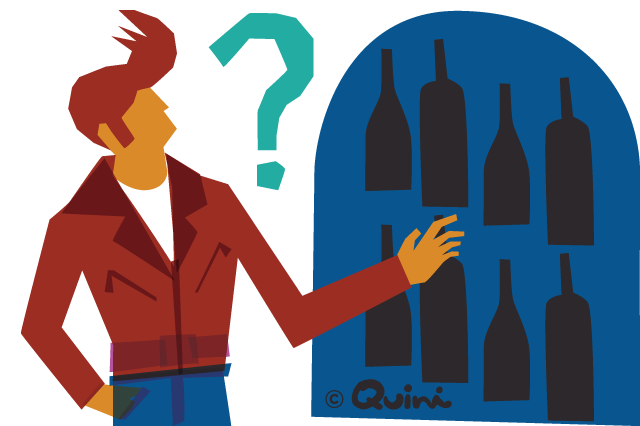 So, how does the average consumer investigate and select wines to purchase? Too often, you are stuck depending on recommendations from wine attendants that share a supposedly educated opinion regarding the quality of available wine carried in their inventory. So, what if these attendants are self-serving and recommend wines that they are told to promote? Perhaps at a higher profit? This is a clear betrayal of trust. This night, I heard memorized talking points taken from marketing pieces with very little relevance to the actual product. Do any of these wine educated people have a personal opinion? Mailly – I have never tasted a Mailly Champagne I liked. This producer threw the time-honored Champagne flavor profiles out the window to make what they must think us crazy Americans will buy! Champagne should be clean and crisp and the bubbles should dance on your tongue. This was their Demi-Sec (slightly sweet) variety. The wine was thick and rich and cloyingly sweet. It had a strong bitter aftertaste. The typical yeasty smell of some champagnes was on the nose, but on the palate it seemed to add a buttery character to the wine. Save your money and buy some Mumm Cuvee instead, or spend a little extra to buy a Piper-Heidsieck Cuvee. Albrecht – What happened to Albrecht Pinot Gris? My memory of their wines puts them in the same category as Trimbach for quality. Maybe it was this vintage? This was tasteless with no aroma. For a similar price, try a Trimbach PG instead. Amici – This is a totally manipulated Chardonnay, with too much oak. There was a strong bitter flavor that often comes from a malolactic fermentation that did not go as planned. This is rich and buttery, but the fruit is not fresh and it should have had more acidity. Way down on my list. For less money, try the Sonoma-Cutrer Sonoma Coast Chardonnay and experience a proper entry level oaked Chardonnay. Ceja – The first reasonable quality wine of the night. This offered a fairly average representation of a typical Carneros Pinot Noir. I am not a big fan of all that fresh red cherry in these wines, but at least this one was pretty typical. Try Schug, or Acacia Carneros Pinot Noir instead for something a little more interesting at about the same price. Ringland – Ugh, sweet medicinal cough syrup. ’nuff said. H to H – The second of the two reasonable wines. This is a fair representation of a Chateauneuf du Pape and at this price point: a good effort. It misses the jammy fruit, tannins and acidic structure you would expect. On the other hand, it IS hard to find a good CDP for less than $40/btl. Truett Hurst – We were told this wine was better than “The Prisoner” and once tasted, you will never go back. This “One Armed Man” tasted like it really needed the other arm. The wine tasted mostly like a cheap Paso or Lodi Zinfandel. The Prisoner blend doesn’t hit you in the face with the Zin and other varietals are added to bring tannins and acidity to the party. For a few dollars more, find The Prisoner on sale and enjoy. Titus – I am not sure I can even put this in the average Napa cab category. This is over-oaked and manipulated to add a soft, smooth texture at the expense of the freshness of the fruit. A young Napa cab should have fresh fruit, high acidity and tannins. This wine was short on all the character that makes a Napa cab special. For near the same price, try the Baldacci Four Brothers Cab Sauv and taste what a Napa wine should be at this price.